B020-1023. Large Fancy Black & White Leatherette Chess Board. This handsome black and white Chess board can be used with almost any set of chess pieces. It has a luxurious finish with a fabolous border inlay. The board measures 18x18 inches with 1 3/4" inch squares. BO165-1024. 18"Fancy Brown & White Leatherette Chess Board. B023-1018. 18" Brown & Natural Walnut Veneer Chess Board. his beautifully finished chess board is made with the finest quality Walnut veneer. It is a great value and goes well with almost all chess pieces.This is an 18" chess board with 2" squares. This is an ideal and afordable chess board with chic look and unique stripe border inlay on thick frame. The deep colors of this board goes with virtually any chessmen set. The board measures 19” x 19” with 1 7/8” squares. This attractive chessboard has a natural semi matte finish that shows off the dark and light tones of Padauk and walnut wood. This chess board looks great with almost all chess pieces. The board measures 20.5" x 20.5" with 2.2" squares. This is a padauk and maple wood chessboard with a classical appeal! The inlay stripe border on its wide frame and rounded edges adds a look of distinction to this handsome board. Combine with the chess pieces of your choice to create a truly unique chess set. This chess board measures 21" with 2.2" squares. The Executive chessboard is made by Mark of Westminster, a well known manufacture for quality furniture and real wood veneer inlays. 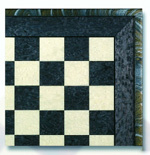 Ebonized Birdseye Maple is the perfect choice for those who are looking to purchase a rich solid black chessboard. The dark squares of this board are lacquered black with no grain. This is a very unique board, Mark of Westminster only produces less than 100 of these each year. This board is well complemented with a variety of chess piece styles, however we do have a matching chessmen set available that goes perfectly with this board. All sizes for this chessboard are shown below. This elegant and unique chessboard that is intricately made from ebony birdseye maple veneer wood features a handsome wide stripe inlay border that adds a look of distinction to this board. From its unique border inlay, to the details of the frame and rounded edges, this board is simply stunning! The board is 21" with 2.2" squares. This exquisite black and birdseye chessboard features a classical appeal that makes it ideal for any richly colored chessmen set. The board measures 20.5" with 2.2" squares. BO134A-451. Fancy Sycamore & Walnut Chess Board With Inlaid Mosaic Border. This handsome chessboard is crafted from high quality Sycamore and Walnut wood. This chess board features neutral tones of dark and natural wood that can be complimented with almost any chess pieces. The board has a luxurious semi gloss finish with a beautiful inlaid mosaic border that adds a touch of distinction to the piece. All sizes for this set are shown below. This chess board is available in the sizes shown below. This handsome chess board features burgundy & gold pressed leather on wood with beautiful art work motif on frame. Combine this board with rich color chess pieces to create a personalized chess set. The board measures 18” x 18” with 2” squares. Recommended king height for this board: 3-3/4” – 4”. This is a European Walnut is a brown wood that is considered a luxury for chess boards. This Mark of Westminster Walnut chess board use European Walnut, which is not as dark as the black walnut seen regulary in North America. The heartwood varies in color but it typically has a grayish-brown background with ir regular dark streaks. The grain is usually straight, but may occasionally be also wavy. European walnut has an extremely high natural durabilty. The chessboard measures 20" x 20" with 2-1/4" squares.